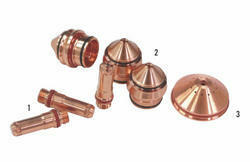 Air plasma house is importer, distributor of complete range of plasma consumables. Hypertherm plasma consumables, hypertherm plasma spares, hypertherm plasma cutter, hypertherm plasma consumables max200, maxpro200, hsd130, hpr130, hpr260 etc. 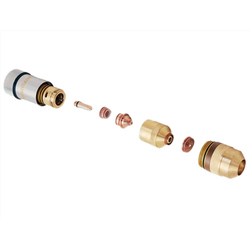 Incorporated with a wide variety of features & specifications, we are offering our clients a quality assured range of Hypertherm MaxPro200 Plasma Torch Parts.Hypertherm Plasma COnsumables,Hypertherm Maxpro consumables,These nozzles are widely available to the customers at the most comprehensive and market leading price range. Manufactured using high grade raw material, this range has been completely checked on number of parameters to ensure its tandem with the highest quality norms and standards. Our organization has gained immense recognition in the competitive markets as the prominent manufacturer and supplier of this high quality and precision range of Hypertherm HT2000 Consumables in India. This consumable range is extensively applicable in a number of applications of plasma cutting, welding and much more. Customers can chose from a wide variety of this range. Looking for Hypertherm Plasma Consumables.MAX200 ?